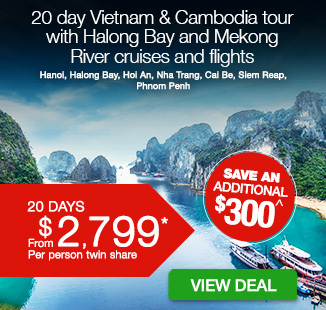 21 day Vietnam, Cambodia & Laos Tour including return international flights, superior accommodation, breakfast daily, all transfers, overnight Halong Bay cruise, professional tour guides, in-depth sightseeing and more. It was just what I had hoped for. The trip represented very good value for money. Was an amazing holiday. Tour guides were fantastic. Escape the every day and embark on a 21 day Vietnam, Cambodia & Laos Tour, full of culture, history, stunning sights and endless beauty. 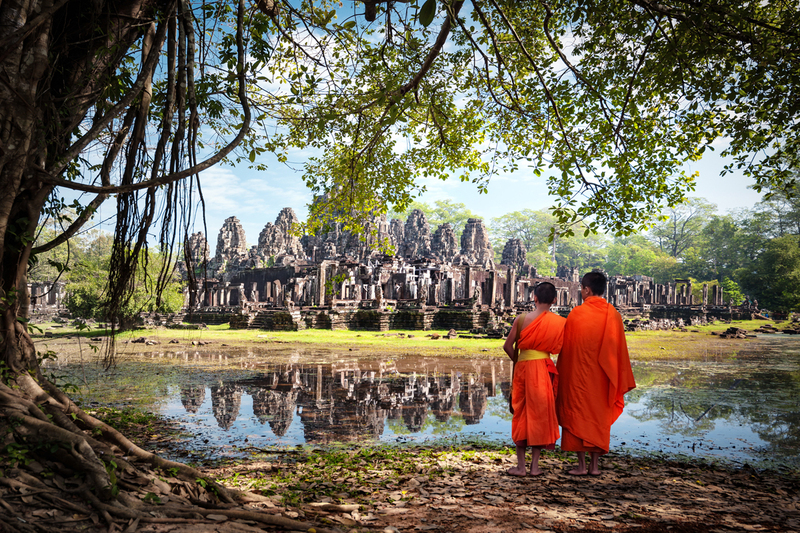 Discover ancient Phnom Penh and learn of its turbulent past, explore rural Cambodia in Siem Reap, admire stunning Angkor temples, wander Luang Prabang and enjoy the local markets of Hanoi. 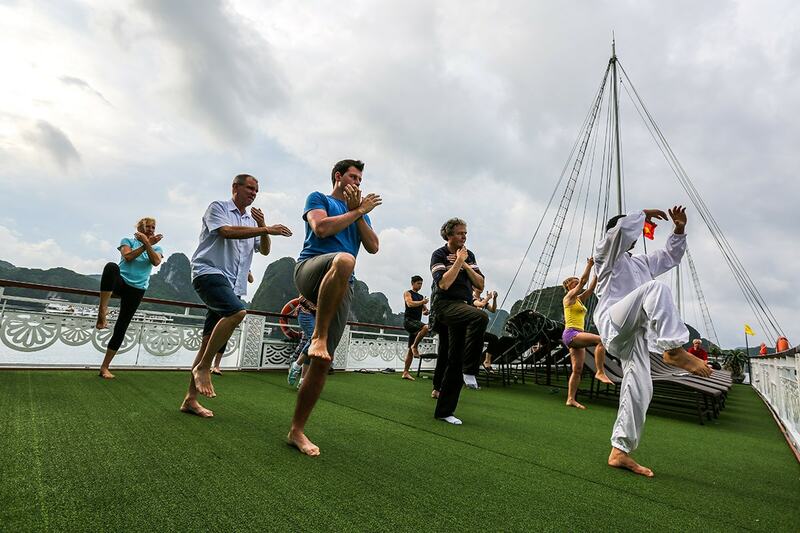 Cruise the majestic Halong Bay, meet the locals in Hoi An, see Ho Chi Minh City‘s most famous sights and so much more. 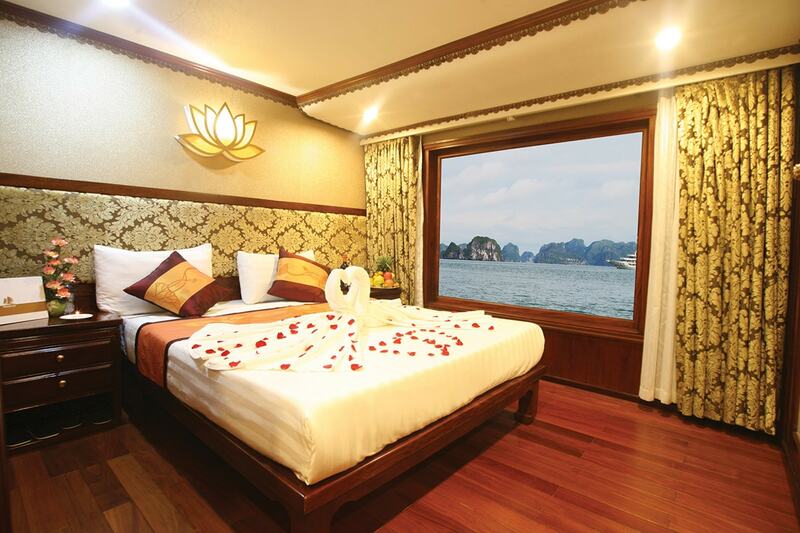 Your package includes return international flights, superior accommodation, breakfast daily, all transfers, overnight Halong Bay cruise, professional tour guides, in-depth sightseeing and more. 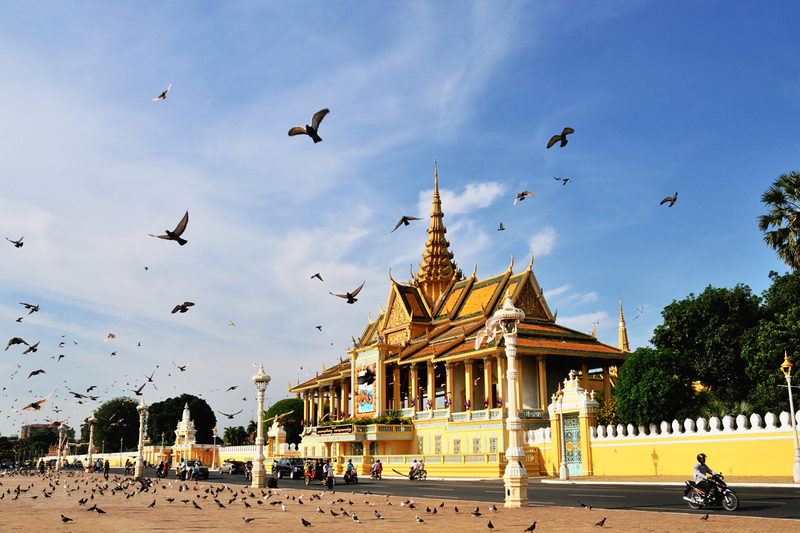 Depart for Phnom Penh, the capital of Cambodia, transiting in Saigon. On arrival in Cambodia, you will be taken to your hotel for check-in. Today, you will visit Tuol Sleng Genocide Museum, a former high school which was used as the notorious Security Prison 21 (S-21) by the Khmer Rouge regime before heading to Royal Palace to learn about the atrocities that took place here. Afterwards, continue to visit the National Museum, Cambodia’s largest museum of cultural history. Take a 6-hour drive through the rice fields to Phnom Penh. The journey offers an excellent opportunity to observe rural Cambodia up-close. Stop along the way and visit a market, where every assortment of street food is available, including a Khmer favourite, fried spiders! Once you arrive in Siem Reap, you will check in to your hotel and spend the rest of the day at leisure. 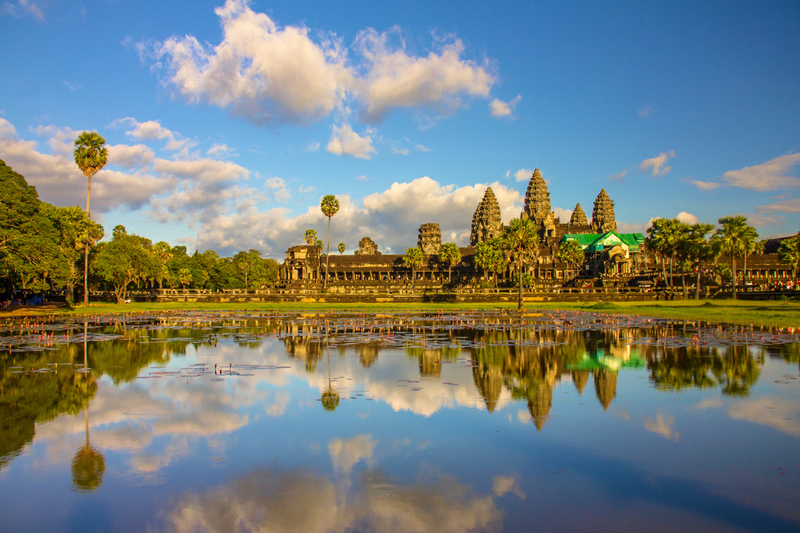 Spend a full day discovering the mystical Angkor temples. The world heritage site with soaring towers and extraordinary bas reliefs. It is one of the most amazing man-made monuments in the world. 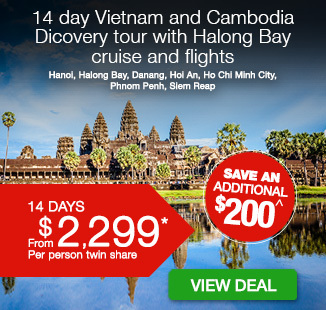 Visit Angkor Wat, Ta Prohm Monastery, Angkor Thom, Bayon and the Elephant Terrace. Tonight, we are honored our guests the dinner with “Apsara Dance”. Take this opportunity to explore Siem Reap at your own pace. Be sure to check out some local restaurants for a taste of world famous Cambodian cuisine. Optional Tour (at own expense): Choose to visit Tonle Sap Lake. Start your trip with Kampong Kleang, a floating village on the Tonle Sap Lake, and as yet bypassed by mass tourism. All the houses are on stilts offering an exceptional natural environment with breathtaking views of floodplains, rice fields and water vistas as far as the eye can see. Walk through the village meeting the locals and a family who raises crocodiles. Afterward, return to the hotel for free time. Optional Tour (additional cost applies, refer fine print): Phare Circus in Siem Reap Tour. Siem Reap’s most unique, authentic, top-rated evening entertainment. You’ll feast your senses on a 90-minute spectacle that blends a riveting theatre with folk music and distinctly Cambodian stories. Optional Tour (additional cost applies, refer fine print): Sunset Q-Bike Adventure. Siem Reap’s most unique, authentic, top-rated evening entertainment. You’ll feast your senses on a 90-minute spectacle that blends a riveting theatre with folk music and distinctly Cambodian stories. After breakfast you will be transferred to the airport for your flight to Luang Prabang, Laos. On arrival, you will be met by your driver and tour guide and transferred to your hotel. Today, you have a full day visiting the National Museum, the former Royal Palace which houses a collection of valuables, including the famous Prabang Buddha statue and gifts received from foreign dignitaries. 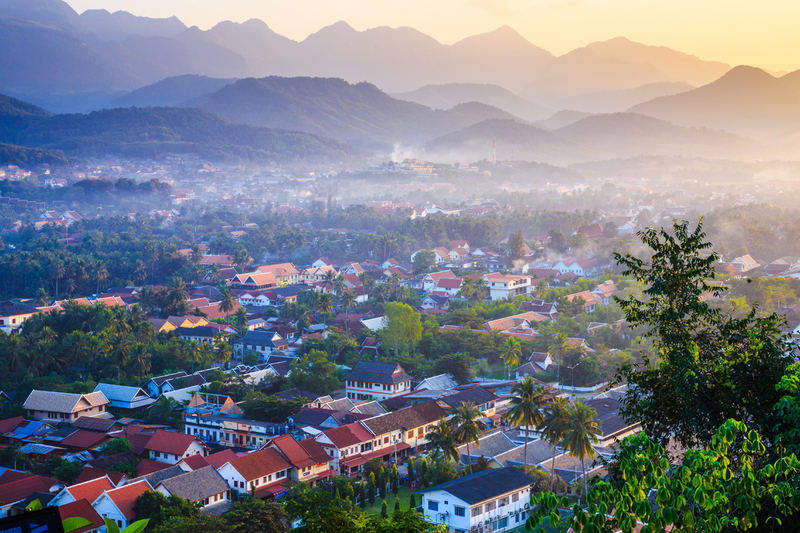 Previously a religious capital, Luang Prabang showcases more than 100 temples, considered amongst the most beautiful in Laos. In particular, you will discover, Vat Xieng Thong or Temple of the Royal City – a vast collection of sacred buildings and the most beautiful temple in the city. Vat May – built at the end of the 18th century, a capped sanctuary featuring a five sided roof surmounted by three parasols. Vat Visoun – the oldest temple in the city with its wooden windows inspired by the Khmer Temple of Vat Phou. Vat Aham – framed by two large Banyan trees. Vat Senna – the first monastery whose roof was to be covered with yellow and red tiles. After we will visit TAEC Cafe, located inside the Traditional Arts and Ethnology Center (TAE), and take a tour of TAEC, a museum dedicated to exploring the rich diversity of Laos ethnic minorities. Traditional costumes, tools, and artifacts are on display alongside in depth descriptions and written histories. It is a great opportunity to gain insight into the Lao people. 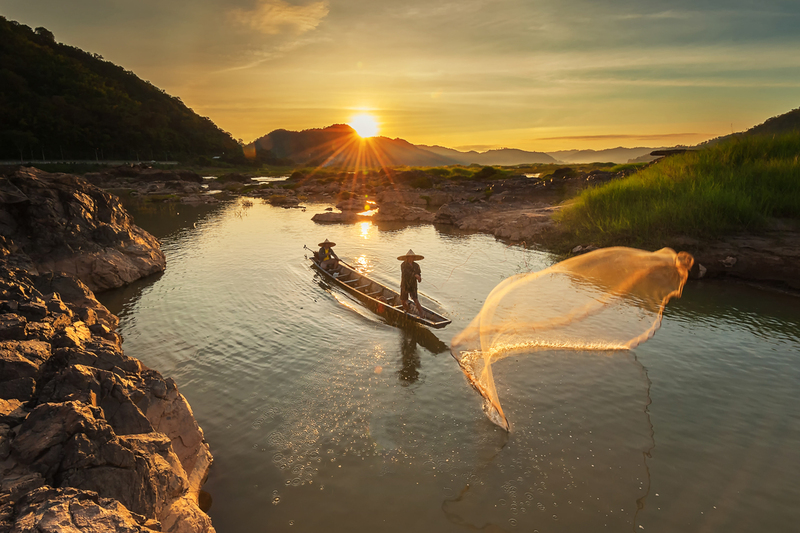 This morning embark on an upstream cruise on the Mekong River, which also gives us a breathtaking view of the tranquil countryside before reaching the mysterious Pak Ou Caves. These two linked caves are crammed with thousands of gold lacquered Buddha statues of various shapes and sizes left by pilgrims. Along the way, we will stop at the village of Ban Xanghai, where they make local rice wine. Relax and enjoy the leisurely cruise back to Luang Prabang. Upon arrival in the city we will go directly to the beautiful Kuang Si Waterfall where you can cool off with a refreshing swim in the pools or walk along the forest trails. On our way back to Luang Prabang, we stop to visit the Kuang Si Falls Butterfly Park, a must-visit spot where you can have an optional 15-minute tour to learn about butterflies and local flora. An early start gives a fantastic opportunity to participate in the daily morning rituals of saffron-clad monks collecting offerings of Alms (ubiquitous sticky rice) from the faithful residents. This tradition is very unique in Laos, being the only Buddhist nation still preserving the procession. We will take a short visit to the local morning market near the Royal Palace. At the market, you can find anything from rice, to fresh vegetables, to steamed fish, frogs, and anything else that might be the day’s catch, set up on the ground this is what the locals do every day. This is a great chance for you to get a real flavor of the local culture. 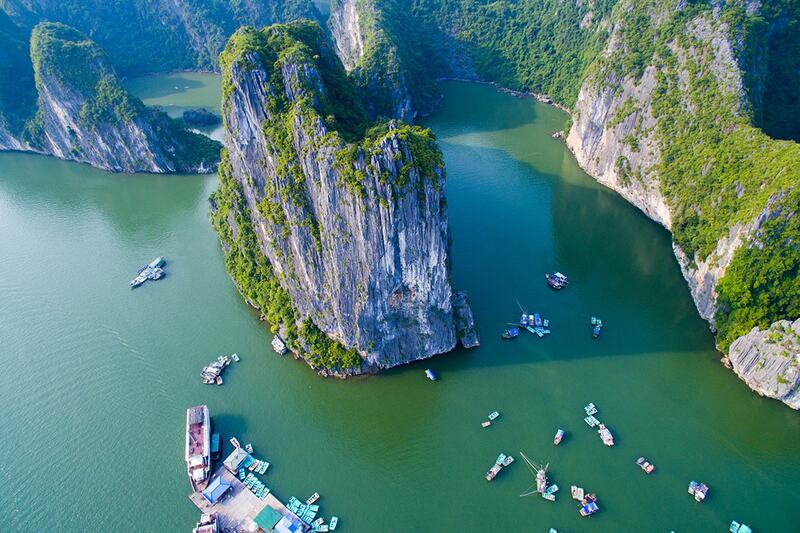 In the afternoon we will check out of our hotel and take a flight to Hanoi – Vietnam’s capital. Upon arrival, you will be transferred to your hotel. The rest of the day is yours for you to relax and settle into your new surrounds. 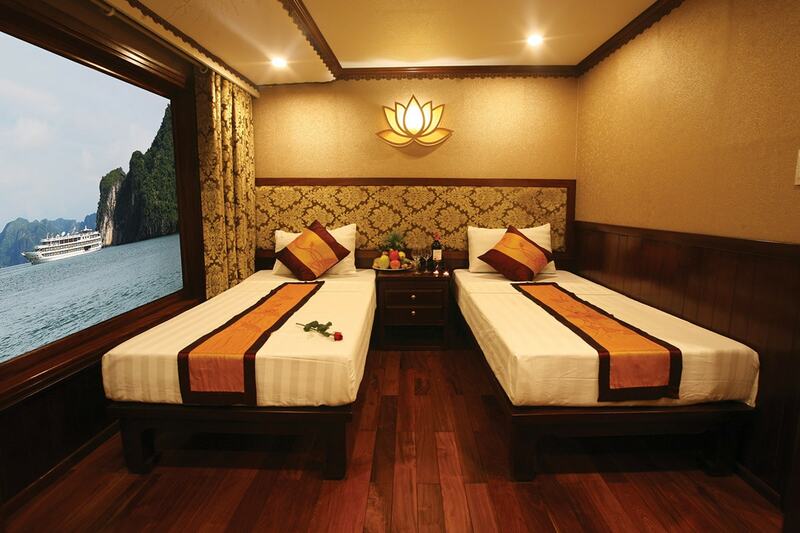 Travel by coach to the rich farmland of the Red River Delta and arrive at Halong Bay. A World Heritage-listed site since 1994, Halong Bay is made up of a sprinkling of islands and wind- and wave-eroded grottoes. 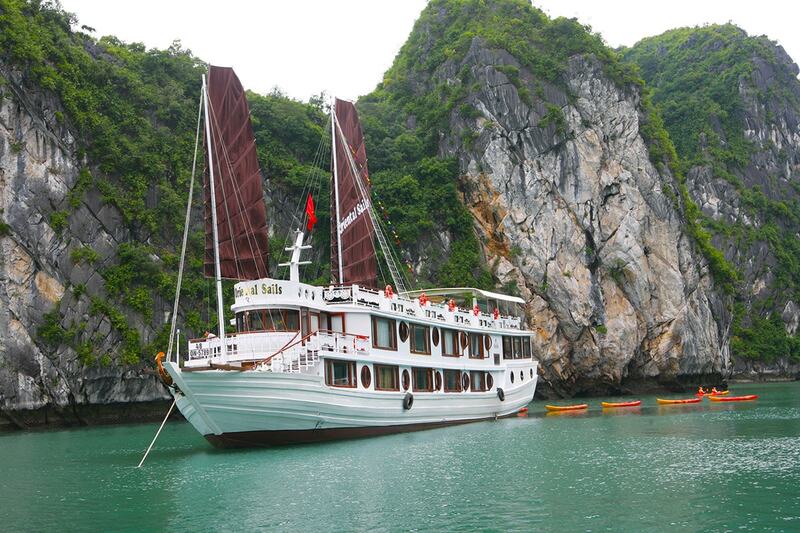 Aboard a ship and be ferried for a closer look at the bay’s limestone islands and caves. There is an opportunity to visit some of the hidden grottoes, tucked beneath the towering cliffs. 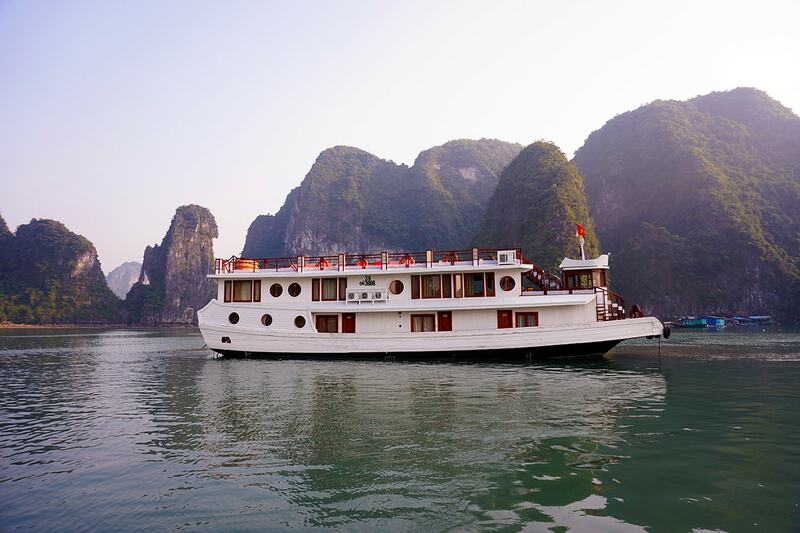 The Halong Bay tour continues today with a morning spent cruising on to the Man’s Head, Tortoise Islands and then Luon Cave by small bamboo boat. After brunch, continue to travel through Bai Tu Long to Bai Chay before disembarking. 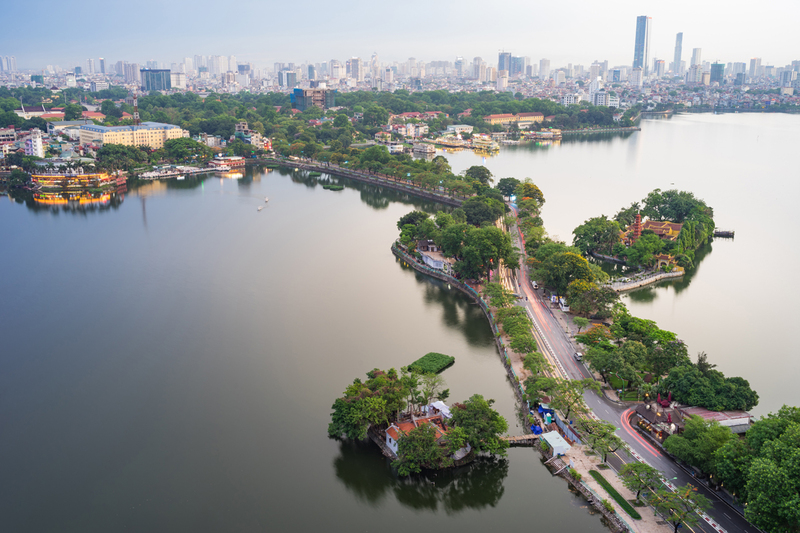 Beautiful Hanoi has enough to keep any traveller entertained for a lifetime. You will have all day today to explore the vibrant city streets, stunning natural landscapes and hidden local gems as you wish. 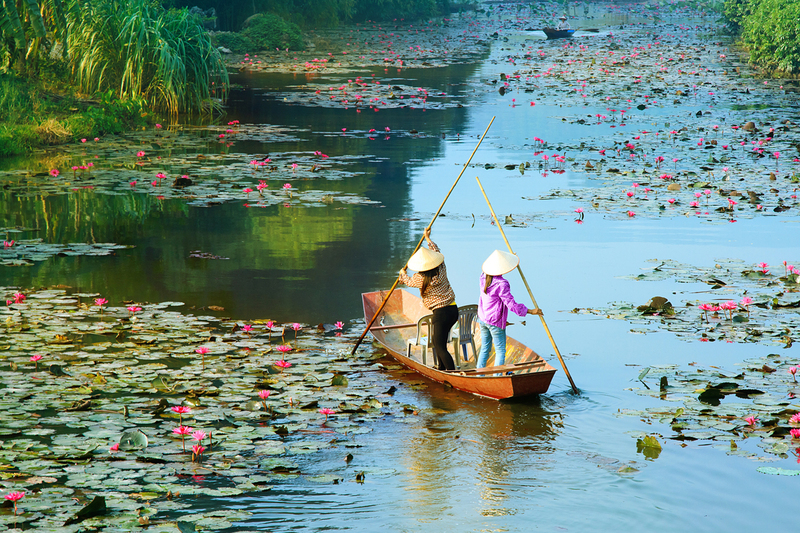 Optional Tour (additional cost applies, refer fine print): Ninh Binh – Hoa Lu – Tam Coc (Kong skull) Visit Ninh Binh, the ancient capital of Vietnam from 968 AD to 1010 AD during the Dinh and early Le Dynasties. You will visit two small temples of the Kings, each of which is nearly a thousand years old. From there you will cycle through the quiet countryside roads to the spectacular limestone peaks of Tam Coc, passing colourful rice paddies and through the rural villages. 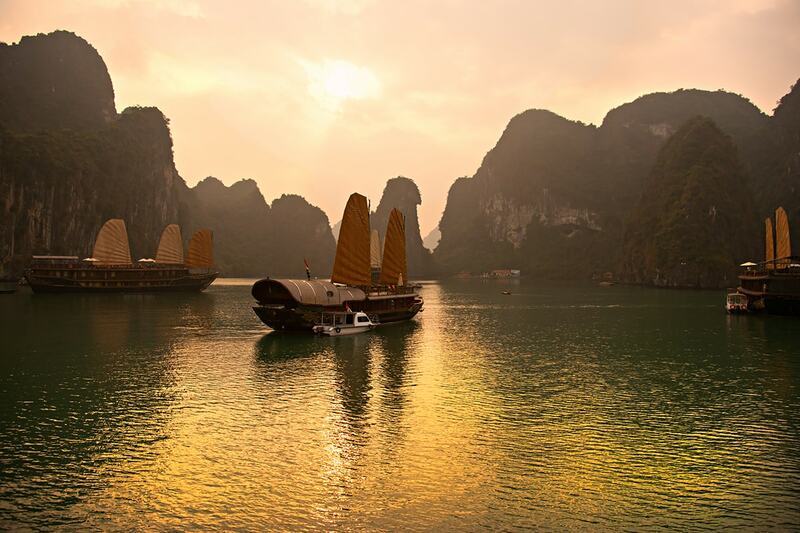 Later, take a traditional boat trip to visit Tam Coc. This morning, you will take a half day Hanoi City Tour to Ho Chi Minh Mausoleum (a monumental edifice built to commemorate the Vietnamese Revolutionary leader), One Pillar Pagoda (one of Vietnam’s two most iconic temples), Temple of Literature (known as the first university of Vietnam) and Tran Quoc Pagoda (one of the oldest pagodas in Vietnam). In the afternoon, get ready for a flight to Da Nang, then, a transfer to Hoi An Old Town. Today you will explore Hoi An on foot, visiting an old merchant’s home, the Japanese Covered Bridge, Hoi An Market and a local Chinese temple. Lunch will be at a local restaurant. Enjoy the afternoon at leisure, wander through the town or relax at one of the many cafés along the picturesque Thu Bon River. Optional Tour (additional cost applies, refer fine print): Hoi An Cooking Class – Take a bite out of the flavours of Vietnamese cuisine and learn what goes into creating typical Vietnamese dishes with this cooking class. A professional chef is on hand to offer tips, tricks and techniques. Finish the class by sampling your creations with your fellow cooks. Optional Tour (additional cost applies, refer fine print): A O Show is a sophisticated cultural show featuring talented. This show will bring you on a journey from the rural to the urban life of Vietnam via a series of sketches and acts involving Vietnamese traditional props. Optional Tour (additional cost applies, refer fine print): Teh Dar Show – Join us a fantastic cultural Teh Dar Show and immerse in an interesting story of Vietnamese highlanders. Get ready to be amazed at the stunning acrobatic movements of the skilled artists and feel the spiritual life’s beauty through an exceptional background live music. Optional Tour (additional cost applies, refer fine print): Tra Que Vegetable Village Tour – Observe and try the local farming activities. Learn the process of planting vegetable such as raking the ground, sowing, watering, picking vegetables and many others. A light meal will be served during the tour. Take the day to explore the delights of this wonderful city at your own pace or enjoy an optional tour. Optional Tour (additional cost applies, refer fine print): Golden Bridge – Travel to the foot of the Ba Na Hills and ride by cable car up to the Marseille station. It is a short walk to the Golden Bridge from the station. The newly-opened bridge has been designed to make its visitors feel as though they’re walking on clouds. Make sure your camera is charged for the incredible photo opportunities! Continue with a walk into le Jardin d’Amour. The whole garden is made up of 9 gardens, all telling different stories and designed in different styles. The last stop of the excursion is a visit to Linh Ung Pagoda to admire the 27-metre high Shakyamuni statue. Take the day to explore the delights of this wonderful city at your own pace. Optional Tour (additional cost applies, refer fine print): My Son Sanctuary & Thanh Ha Village – Depart the hotel for the 40km journey outside Hoi An. Arrive at My Son Sanctuary, a great sample of ancient Champa civilization situated in the southern region of Vietnam. Stand astounded by a great number of exquisite stone sculptures, temples and towers nestled in tropical jungle. There will also be a traditional music show that you can enjoy. Around late morning, we will journey back to Hoi An. 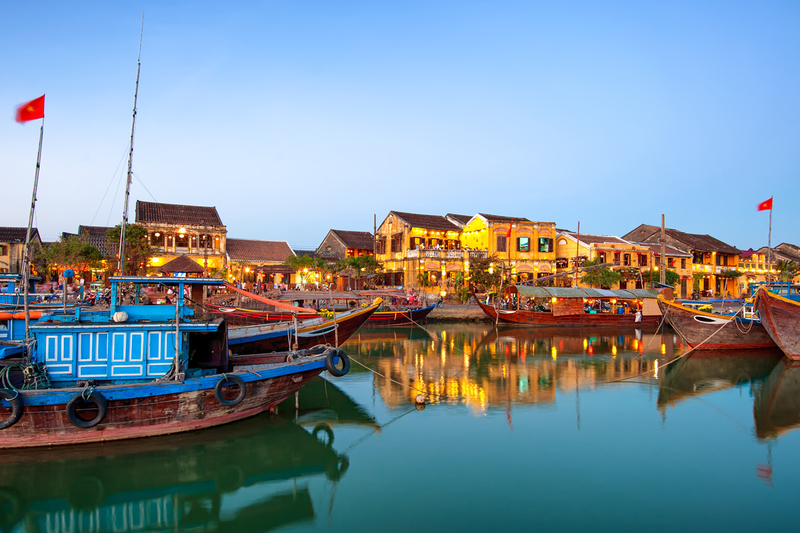 Enjoy a leisurely morning in Hoi An before being transferred to the airport for your scheduled flight to Ho Chi Minh City (commonly known as Saigon). On arrival you will be by met by our tour guide and transferred to your hotel. After breakfast, spend your half day for a Saigon City tour to many highlights such as Notre Dame Cathedral, Post Office, War Remnant Museum and have fun shopping at Ben Thanh market. In the afternoon, continue to Cu Chi Tunnels, a byzantine maze of underground passages, chambers and booby traps used by both the Viet Minh and the Viet Cong during Vietnam-US war. The tunnel system had become legendary during the 1960s as a strategic military base and underground community life. Optional Tour (additional cost applies, refer fine print): Vespa Adventure – Saigon After Dark Tour. Discover Saigon’s nightlife on the back of a vintage Vespa scooter. Enjoy your amazing night by whisking away the city and stop by some shops to taste Saigon’s best authentic local food. 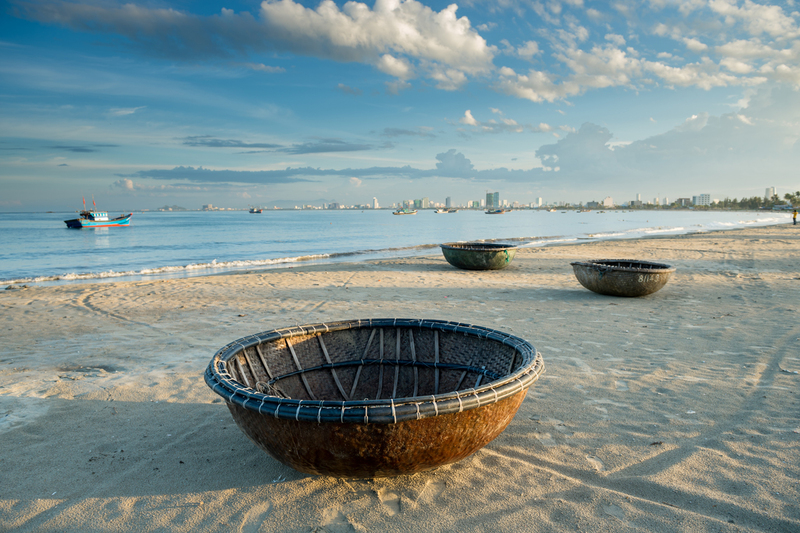 Optional Tour (additional cost applies, refer fine print): Mekong Delta – Travel to Ben Tre to discover the unique lifestyle of inhabitants living along the Mekong Delta. Visit fruit and bonsai gardens, a coconut candy workshop and a rice paper mill. Bike ride or travel by horse carriage along the village road and enjoy local delicacies and tropical fruits, before you head back to Saigon this afternoon. Lunch will be included on your Mekong Delta tour. This morning you will have some free time for any last minute sightseeing or souvenir shopping before your transfer to the airport for your flight home to Australia. Once you have completed your online booking you will receive an Order Confirmation, which will include a link to complete our Travel Partners booking form. This booking form MUST be completed and submitted to our Travel Partner in order to confirm your booking. A deposit of $1,129/$1,429/$1,629 per person are due at the time of purchase in order to secure your date. Including a minimum of 1 x checked bag up to 23kg per passenger. Arriving early/Extending your trip: $200 per person (subject to availability and applicable fare difference). If you wish to alter or extend your trip, please purchase your voucher first and submit a request on your booking form. We will then provide quotations for any alternations or extensions. Should you wish to proceed any additional charges will be collected. However if you are unhappy with the options a full refund of the voucher will be provided.